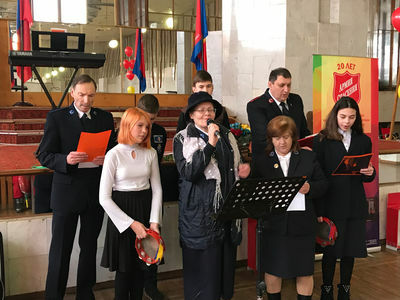 On January 13, 2019, a holiday worship service was held on the occasion of the 20th anniversary of the ministry of the Salvation Army in Simferopol. 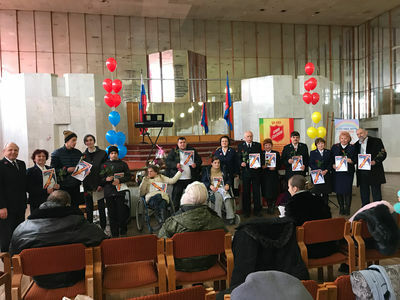 Salvationists from Yalta also joined the celebration, as well as representatives of non-profit organizations with whom the Salvation Army works together. The ministry was filled with praise to the Lord, prayers and wonderful testimonies of what God did in this city through the Salvation Army. It was pleasant to hear warm and kind responses from the partners in social services about help and support the Salvation Army provided and continues to provide to the residents of Simferopol. The Commanding Officer of the Salvation Army in Russia, Lieutenant-Colonel Alexander Kharkov, warmly congratulated those present on the anniversary, shared a word, wishing salvationists and friends of the Salvation Army in Simferopol God's blessings and growth in Christ.